"The question that arises out of social welfare law is whether it is always necessary for everybody who has quite real problems to have a lawyer at £200-odd an hour, or whether there are better and more effective ways of giving advice"
There are lawyers, and there are lawyers. Some are very talented, and their skills earn them hundreds of pounds per hour. Others are equally talented, but don't work in sectors that command the big bucks. Squarely into this latter camp fall social welfare solicitors paid by the government to help people who can't afford a lawyer. These lawyers do not routinely make £200 an hour. Legal aid for non-criminal cases is available only to people who pass a means test, and have certain kinds of legal problems. These include some that are covered by "social welfare law", such as debt, employment and housing cases. Legal aid isn't generally available for disputes over the award of benefits, although it is for high-level appeals. Lawyers get set fees for this work. For a relatively simple housing case, for example, it's £160. If it's more complicated—more than a day's work would be a rough guide—an hourly rate will kick in. This doesn't approach £200 an hour. The rate for legal help and advice is just under £50 per hour for some social welfare cases, just over it for others (such as helping someone challenge a council decision that they aren't eligible for assistance in finding a home). 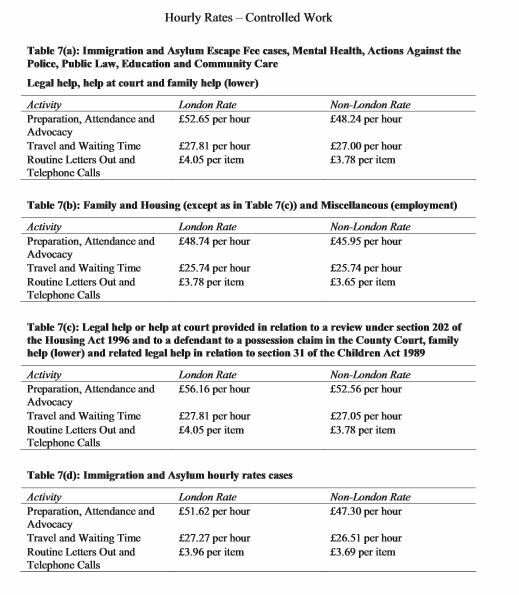 Actually representing someone in court, or preparing for a hearing, costs the state £60-£70 an hour for this kind of work. The Ministry of Justice stood over the claim, citing scenarios where £200 an hour might be paid, but it doesn't publish the information necessary to work out how often those scenarios might arise. It told us that if a senior barrister is hired for a case that goes to the Court of Appeal or Supreme Court, they can be paid up to £225 an hour. Such cases are by definition complex, though, and it's unlikely that they're what Lord Faulks had in mind when he talked about replacing the lawyer with "better and more effective ways of giving advice" in a typical case. The MoJ also argued that if a set fee is around £200—as in a case concerning debt, which is £180—and it only takes an hour to complete, the lawyer is effectively getting £200 an hour. It doesn't publish the data on how long legal aid cases typically take, but legal aid lawyers argue that almost no case can be wrapped up that quickly. Working out whether someone is even entitled to legal aid, and getting briefed on what their case is about, takes time. We're submitting a Freedom of Information request to try to work out the frequency of these £200-an-hour scenarios. That we have to do this suggests that they're not typical and don't justify implying that the general experience of legal aid practitioners is to charge at this rate. The minister characterised the question as being whether a £200-an-hour lawyer is "always necessary for everybody" in a social welfare case. His department has provided no reasonable evidence that more than a hypothetical handful generate these kinds of costs—never mind "everybody". Of course, some lawyers do routinely charge hourly rates of several hundred pounds. But that's on the private market for lawyers, which shouldn't be confused with the rate offered by the government for legal aid work. Either way, the hourly amount charged isn't what the lawyer takes home. Fees of £50 or £60 an hour have to cover overheads as well as lawyers' salaries.